Annnnd its a new week! even if you hate Mondays, you have to admit that the prospect of a new fresh start is pretty exciting, and especially where its a new month, with new holidays coming up, that means I can shed off stresses and frustrations from last month and start over. Don't you think so? 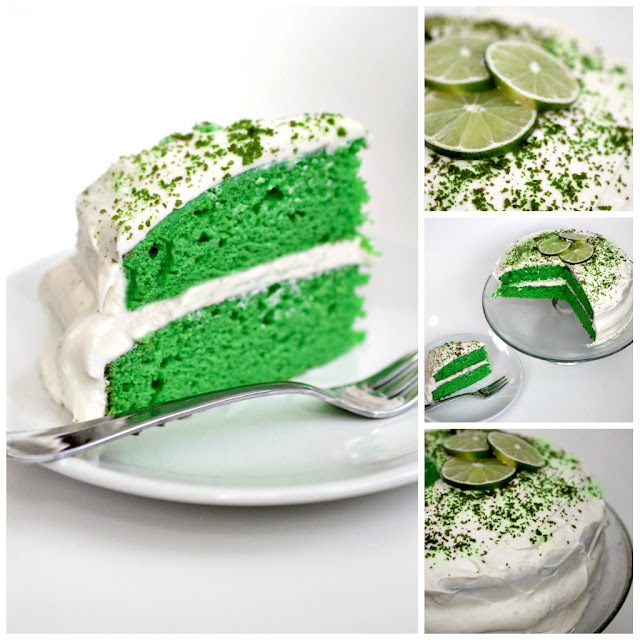 Well anyways, moving on, to a perfectly delicious and very St. Patty's Day appropriate dessert! I'm blasting this cake back from the past (in all its sad picture glory), because its simple to make, yummy to eat, and because this is my blog and I do what I want! haha So if you're interested, just head on over here to view the recipe or click the picture, and get baking! This is definitely a new tradition for March in this house, because we try and have at least one themed dessert per holiday(and this can never be outdone), I always love tart and sweet combined, and because its probably the moistest (sp? :)) cake I've ever had. Hope you give it a try, let me know what you think! Love it!!! Such a cute cake and sounds like a yummy flavor too. Usually green is not a color that makes something look delicious but this is on point! Definitely mouthwatering. This looks so yummy! I've recently been loving Yoplait's key lime pie yogurt, and the light version tastes the same but barely has any calories!